Romancing SaGa (ロマンシング サ・ガ, Romanshingu Sa・Ga) is a role-playing video game originally developed and published by Square as the fourth game of their SaGa series. The game was designed by Akitoshi Kawazu who had served as head developer for the previous SaGa titles, with fellow series veteran Kenji Ito providing the game's soundtrack. Set in the fictional world of Mardias, Romancing SaGa allows players to assume the role of one of eight main characters who must journey across the world to prevent the resurrection of an evil god named Saruin who was sealed away a millennium previous. Initially made available in January 1992 for the Super Famicom, the game was later ported to the WonderSwan Color handheld system in December 2002, with both releases being exclusive to Japanese players. 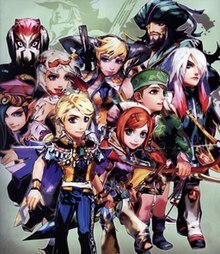 In April 2005, an enhanced remake of the title for the PlayStation 2 called Romancing SaGa: Minstrel Song (ロマンシング サガ -ミンストレルソング-, Romanshingu Sa Ga -Minsutoreru Songu-) was released in April 2005 in Japan, and in English for the first time in North America the following October simply under the title Romancing SaGa. In 2009, the original Super Famicom version was ported to mobile phones in Japan. The Super Famicom version has been released on the Wii, Wii U and New 3DS Virtual Consoles in Japan. The PlayStation 2 version was released as a PS2 Classic for PlayStation 3 in Japan. The original Super Famicom version sold over a million copies worldwide and was voted by readers of Japanese Famitsu magazine as the 53rd greatest game of all time in a 2006 poll. Conversely, the PlayStation 2 remake received largely mixed to average reviews in North America due to the game's high difficulty, steep learning curve, and questionable character designs. Romancing SaGa is a traditional role-playing video game set in a fantasy world where players must navigate their characters through towns, dungeons, and other environments while taking part in the game's story by interacting with non-player characters. At the start of the game, the player is given the option of assuming the role of one of eight main characters, each with their own strengths, weaknesses, and starting points throughout the game's world. In addition, the player must select the profession of the character's parents from a list of eight choices each, which go towards determining their strengths. As a staple of the SaGa series, both gameplay and story are largely open-ended, giving the player the ability to play through scenarios in a number of different orders, with some areas and portions of the narrative only becoming available once they have spoken to specific characters or performed certain tasks. By completing story objectives and meeting new characters, the player is brought closer to the game's end, leading to the final confrontation where they must use all of their acquired skills to succeed. While traveling through dangerous environments, the player's party can do battle with enemy monsters which roam around the screen and will enter combat when touched. Using a turn-based approach to combat, battle scenes are played out by having the player input commands for each individual party member at the start of each round, with the selected actions taking place in accordance with a character's "speed" statistic. A player may choose to attack an enemy, use a special weapon skill, cast a magic spell, defend themselves, or flee from battle entirely. Parties can consist of up to five characters that the player will recruit automatically as part of the story, or after they have completed certain story scenarios. As characters take part in more battle, they will randomly learn new weapon skills by attacking normally, as well as randomly gain increased statistics at the end of every few battles, thereby becoming stronger. All characters may become equipped with up to two different kinds of weapons, as well as become outfitted in protective gear that increases their defense against attacks. While the core gameplay of the PlayStation 2 version of Romancing SaGa remains the same as the original, the game is now presented using full three-dimensional graphics instead of two dimensional environments and character sprites. The eight original characters return, they may now assume the role of 38 different classes themselves, which give access to differing statistics and special abilities. In addition, the current weapons held by a character now determine which of their randomly increased stats will have a greater chance of increasing after battle. Combat has been expanded to include a new "Spell Synthesis" system, where specific magics can be fused together to create a modified version of a spell with greater power, or even create a new spell altogether. Additional story scenarios and areas have been added for the remake, including a new script and expanded narrative with new content. Characters were re-designed as well, this time by Yusuke Naora (who had previously worked on Unlimited SaGa) instead of Tomomi Kobayashi who was responsible for the character design of the original Super Famicom game. Romancing SaGa is set in the fictional world of Mardias, which was created by the God Marda. Long ago, war raged between three wicked gods, Death, Saruin, and Schirach, and the lord of all gods, Elore. At the end of that long conflict, Death and Schirach were stripped of their powers, and Saruin was imprisoned through the might of the ten Fatestones and the hero Mirsa's ultimate sacrifice. A millennium had passed, and the Fatestones were scattered throughout Mardias. All this time the powers of evil festered, bent on releasing Saruin from his prison. Albert (アルベルト, Aruberuto), an 18-year-old frontier guard, son of Lord Rudolf of Rosalia, master of Isthmus Keep. He is voiced by Yuu Urata in Japanese and Yuri Lowenthal in English. Aisha (アイシャ, Aisha) is a 16-year-old herbologist, member of the Taralian tribe, and a carefree tomboy. She is voiced by Yumiko Kobayashi in Japanese and Carrie Savage in English. Gray (グレイ, Gurei) is a 24-year-old accomplished swordsman who travels the world for love of treasure. He is voiced by Isshin Chiba in Japanese and Josh Phillips in English. Claudia (クローディア, Kurōdia) is a 22-year-old ranger that was raised by the witch Eule. She lives in Mazewood, and has a strong connection to Melvir royalty. She is voiced by Yuko Minaguchi in Japanese and Karen Strassman in English. Jamil (ジャミル, Jamiru) is a 20-year-old thief from South Estamir, voiced by Hiroyuki Yoshino in Japanese and Ted Sroka in English. Sif (シフ, Shifu) is a 28-year-old proud warrior that lives in the icy region of Valhalland. She is voiced by Mika Doi in Japanese and Megan Hollingshead in English. Hawke (ホーク, Hōku) is a 30-year-old pirate with a rivalry with the pirate known only as the Butcher. He is voiced by Unshou Ishizuka in Japanese and Gerald C. Rivers in English. Barbara (バーバラ, Bābara), a 26-year-old beautiful dancer, part of a traveling troupe. She is voiced by Emi Shinohara in Japanese. In September 2000, Square announced it had begun development on an enhanced version of Romancing SaGa for the Bandai WonderSwan Color handheld system. According to the company, some of the original Super Famicom version's planned material was unable to be added during its original release due to memory restrictions, and that the new hardware would allow for a more "complete" version of the game. The newly added material includes an additional story scenario, as well as a side-quest that allows the player to gather all ten "Destiny Stone" items where previously only a few were accessible. While gameplay and audio are identical to the original release, the game's graphics were enhanced to accommodate the system's larger color palette. The game was later released on in Japan December 20, 2001. In a September 2004 issue of Japanese magazine Weekly Shōnen Jump, it was announced that Square, now Square Enix, would produce a full remake of Romancing SaGa for the PlayStation 2 that would take full advantage of the system and bring the game into the new console generation. During a panel at the 2004 Tokyo Game Show, Kawazu described the purpose of the remake as "a functional compilation of the whole SaGa series" that would combine elements from previous SaGa titles into one definitive game, including the "Sketch Motion" art style of Unlimited Saga and the ability to learn to skills in mid-battle first introduced in Romancing SaGa 2. The game, titled Romancing SaGa -Ministrel Song- in Japan, features new, fully three-dimensional graphics, additional story elements, and a completely arranged soundtrack by original composer Kenji Ito, now joined by Tsuyoshi Sekito and Kenichiro Fukui. Square Enix hired singer-songwriter Masayoshi Yamazaki to perform the game's theme song "Minuet", which was also released as a single in April 2005 in Japan by Universal Music. Voice acting is an additional new feature to the PlayStation 2 version, with spoken dialogue occurring during battles or certain story sequences. As a pre-order bonus for customers who reserved the game in Japan, Romancing SaGa was included with a compilation soundtrack featuring battle themes from previous SaGa titles called Kenji Ito × SaGa Battle Music Collection +. During the 2005 Electronic Entertainment Expo in Los Angeles, Square Enix announced that the game would be released in English for the first time under its original title as part of the company's effort to promote more dynamic content from their major franchises. A playable demo was made available at the same event featuring an early version of the English release, as well as the company solidifying the title's release the following October. The North American version features English voice work in place of the original Japanese, though the actors were officially uncredited. The Super Famicom version of Romancing SaGa was a commercial success in Japan, selling over 1.3 million copies worldwide since its release in 1992, as of 2004. Famitsu magazine's panel of four reviewers gave it an overall score of 31 out of 40. In March 2006, readers of Famitsu voted it the 53rd best video game of all time as part of the magazine's "All Time Top 100" poll. The PlayStation 2 remake sold in excess of 450,000 copies during 2005 in Japan, and was the top-selling game in that country between the weeks of May 2 and May 26, 2005. The game sold enough copies to qualify for Sony's Ultimate Hits label, and was re-released in May 2006 at a budget price. Minstrel's Song was well received in Japan. It was given a score of 32 out of 40 by Famitsu Weekly magazine. Dengeki PlayStation awarded the game an average score of 87.5 out of 100, based on four review scores, one of which was 95 out of 100 while the other three were 85 out of 100. Romancing SaGa's English release was met with a mild response from critics, who gave the game a mostly mixed reception. The game maintains a 63% average score from aggregate review website GameRankings, and an average of 58 out of 100 from Metacritic. Among the more average English reviews, Game Informer reviewer panned the game's "outdated" and "abominable" graphics and shallow gameplay, calling it "barely even a game" and the "saddest Cinderella story of the year ... [I] haven't felt this sorry for a game in a long time." GamePro echoed their sentiment, calling the graphics only "moderately pretty" but praising the game's overall art style. The magazine would ultimately declare it "a convoluted and cumbersome RPG that can barely sustain the weight of its bloated and poorly developed story." IGN felt that the game would be enjoyable for fans of the series who were used to the games' open-ended direction and "countless hours of gameplay", but other players may lose interest due to lack of a unifying story or character development. GameSpot additionally felt that there was "no persistent story to keep you playing" coupled with "odd character designs" and a "convoluted battle system" that may alienate players who were not used to it. Despite problems with the title's gameplay and presentation, the website would find the game's music to be "excellent" and "the best part of Romancing SaGa." 1UP.com felt that the game would lack appeal to a casual role-playing gamer, but would "please those gamers who want a very long game" and favored exploration and freedom over a tightly-defined story. Among the more positive English reviews, RPGFan praised the game's open-ended gameplay, recommending it to players who are either "sick of Final Fantasy and its many clones" or are "willing to try something new, interesting, and well-executed," concluding the review by giving "Romancing SaGa a well-deserved 87%, and I will stand by this score even as other reviewers bash this game and throw it to the curb." RPGamer also praised the open-ended gameplay, but noted that it "will not appeal to everyone," noting that gamers "who are able to look past the series' history and give the game a chance may be rewarded with a uniquely engrossing adventure with a style all its own and replay value that is unlimited." Among print publications, Hyper PlayStation magazine gave the game a score of 8.5 out of 10 and JIVE Magazine gave it 3.5 out of 5. An Ultimania guide was published in Japan for the PlayStation 2 version of the game. It includes A Bard's Tale, a 31-page novella written by Benny Matsuyama. ^ 船津稔 (September 24, 2004). "スクウェア・エニックス、「BUSINESS CONFERENCE」開催 - ニンテンドーDS「エッグモンスターHERO」など多数の新作を怒濤の発表". Game Watch. Archived from the original on September 29, 2010. Retrieved 2010-01-31. ^ a b Witham, Joseph (November 23, 2001). "Romancing SaGa WonderSwan Color Release Date Set". RPGamer.com. Archived from the original on June 21, 2009. Retrieved 2009-03-30. ^ Adams, David (October 13, 2005). "Romancing SaGa Ventures into Stores". IGN. Archived from the original on November 4, 2012. Retrieved 2009-03-30. ^ Niizumi, Hirohiko (February 7, 2005). "Romancing SaGa: Minstrel Song dated for Japan". GameSpot. Archived from the original on November 4, 2012. Retrieved 2009-03-30. ^ a b "First Look: Romancing SaGa for the WSC". GameSpot. 2000-09-08. Retrieved 2008-12-13. ^ a b Witham, Joseph (November 5, 2001). "Romancing SaGa WonderSwan Color Details". RPGamer. Archived from the original on February 5, 2009. Retrieved 2008-12-13. ^ Stone, Courtney (2004-09-17). "Square Enix Announces Romancing SaGa Remake". RPGamer. Archived from the original on 2009-06-21. Retrieved 2009-03-25. ^ Hindman, Heath (2004-10-07). "Much Singing of Minstrel Song Details". RPGamer. Archived from the original on 2008-07-24. Retrieved 2009-03-25. ^ Ezaki, Kahori & McCawley, James (2005). "Kenji Ito and SQUARE-ENIX talk to CocoeBiz - Inside ~Romancing Saga -Mistrel Song- ~Special (Part 1)". Cocoebiz.com. Archived from the original on 2013-03-27. Retrieved 2009-04-18. ^ Strange, Derek (2005-08-21). "RPGFan Soundtrack - Romancing SaGa -Minstrel Song- OST". RPGFan. Archived from the original on 2009-04-08. Retrieved 2009-03-25. ^ Gann, Patrick (2005-04-13). "RPGFan Soundtracks - Minuet". RPGFan. Archived from the original on 2009-06-06. Retrieved 2009-03-25. ^ Niizuki, Hirohito (2005-04-07). "Romancing SaGa: Minstrel Song dated for Japan". GameSpot. Retrieved 2008-12-13. ^ Gann, Patrick (2005-04-13). "RPGFan Soundtracks - Kenji Ito × SaGa Battle Music Collection +". RPGFan. Archived from the original on 2005-11-23. Retrieved 2005-08-21. ^ Hindman, Heath (2005-04-25). "Square Enix Lifts E3 Curtain, People Say, "Ooo"". RPGamer. Archived from the original on 2005-08-31. Retrieved 2005-08-21. ^ Onyett, Charles (2005-05-18). "E3 2005: Romancing SaGa". IGN. Archived from the original on 2012-11-04. Retrieved 2005-08-21. ^ a b c Sullivan, Meghan (2005-06-25). "IGN: Romancing SaGa Review". IGN. Archived from the original on 2012-09-05. Retrieved 2009-03-25. ^ a b c d e f g h "Romancing SaGa Reviews". GameRankings. 2005. Archived from the original on 2009-03-02. Retrieved 2009-02-01. ^ a b "Romancing SaGa (ps2:2005): Reviews". Metacritic. 2005. Archived from the original on 2012-11-04. Retrieved 2009-02-01. ^ a b Pinckard, Jane (2005-10-11). "Romancing SaGa: Ministrel Song Review from 1UP.com". 1UP.com. Archived from the original on 2011-06-04. Retrieved 2009-03-25. ^ a b "ロマンシング サ・ガ". Archived from the original on 2016-03-17. ^ a b "2005's Famitsu Scores Archive". Famitsu Scores Archive. Archived from the original on 2009-02-05. Retrieved 2008-12-13. ^ a b Juba, Joe (November 2005). "Romancing SaGa Ministrel Song Review". Game Informer (195). Archived from the original on June 21, 2009. ^ a b c The Watcher (November 2005). "Romancing SaGa Review". GamePro (196): 146. Archived from the original on 2011-06-07. ^ a b c Mueller, Greg (2005-10-10). "Romancing SaGa for PlayStation 2 Review". GameSpot. Retrieved 2009-03-25. ^ Frost, Steven (January 2006). "Romancing SaGa Review". PSM (111): 72. ^ a b "Japan Votes on All Time Top 100". Edge Online. 2006-03-03. Archived from the original on 2008-07-23. Retrieved 2008-12-20. ^ "Company Data: February 2, 2004-February 4, 2004" (PDF). Square Enix Japan. Archived (PDF) from the original on November 9, 2013. Retrieved 2008-12-13. ^ "The Magic Box - 2005 Top 100 Best Selling Japanese Console Games". The-MagicBox.com. Archived from the original on 2009-01-20. Retrieved 2008-12-13. ^ Jackson, Jordan (May 2, 2005). "Golden Week". RPGamer. Archived from the original on February 5, 2009. Retrieved 2008-12-13. ^ Jackson, Jordan (May 26, 2005). "Neko". RPGamer. Archived from the original on February 5, 2009. Retrieved 2008-12-13. ^ "The Magic Box: International Videogame News". The-MagicBox.com. March 6, 2006. Archived from the original on June 5, 2008. Retrieved 2008-12-17. This page is based on the Wikipedia article Romancing SaGa; it is used under the Creative Commons Attribution-ShareAlike 3.0 Unported License (CC-BY-SA). You may redistribute it, verbatim or modified, providing that you comply with the terms of the CC-BY-SA.